These are the show notes to an audio episode. If you want to listen online, please use the direct link below. http://media.libsyn.com/media/airspeed/AirspeedAcroCamp02.mp3. Not much in the way of show notes for this one, but be sure to listen. Don Weaver is one of the IPs who will be instructing at Acro Camp. In this episode, you get to hear his take on aerobatics and what you can expect if we pick you as a camper. Find Don on Twitter as @DonRWeaver or at www.mytransponder.com as DonFlies. And see the OptAir Shares site at www.optair.com. This is a regular blog post. You can find show notes to episodes – and links to episode audio and video – in the other entries. I finally got a chance to escape from the office and get up for the first time with Acro Camp IP Don Weaver. Although we have spent a fair amount of time talking about the project, we haven’t been in the same aircraft yet. So we got up for 13 or 14 trips around the pattern at KPTK on Wednesday to test out some camera placements and get to know each other in the air. 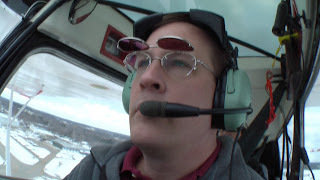 I have a good deal of tailwheel time (at least compared to the average pilot), but wanted to get my groove back and spend some time understanding Don’s teaching style. We had a about a seven-kont crosswind, so it was a good day to work on wheel landings under those circumstances. I nailed three three-point landings first and then we set about the business of working on the wheel landings. The crosswind was just enough to support rolling down the runway with the wail up, banked over a little to the right, and with only the right main on the ground. Over the course of the next nine or ten landings, I got a much better feel for what it’s like to dance the Citabria around a little. In fact, you’d have to push a lot harder than I did to get the prop anywhere near the ground. It’s just a sight picture and a kinesthetic sensation that you have to get used to. By about the 10th trip around, I was reasonably competently putting it on the right main and keeping it there for an appreciable part of the trip down the runway. 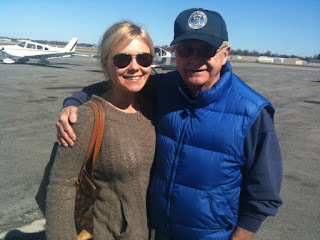 Don’s a good guy with whom to fly. He seems to share with Barry and a few others the rare gift of figuring out when the student is figuring something out for him self and knowing to shut the heck up for a few moments. That sounds crass to say, but I think we’ve all had motor-mouth instructors who actually keep you from learning by constantly calling out every little thing. It’s like asking you on the first tee whether you inhale or exhale on your backswing. I don’t know. Just let me hit the ball! I think that Don quickly identified my tricycle tendencies and worked on those elements. He also identified a consistent problem that I have, namely centering the ailerons on landing (when I should have full deflection into the crosswind). Having me get it up on one wheel for the takeoffs and encouraging me to put it down on one wheel for the landings really helped me to see that part of the envelope. We also flew a couple of cameras. These stills are from the Panasonic that I’ve been flying since last year. The other camera is a Sanyo Xacti HD2000 in back, to the right of Don’s head, facing forward. I didn’t have the wide-angle lens for the HD2000 that day, but I think that that placement is going to work out just fine once I get the lens. I just wanted to figure out whether that location worked from a vibration perspective. By the way, the Sanyo HD200 accessory lenses appear to be out of stock everywhere! What gives, Sanyo? And the scumbags at www.elitedeals.com took my order for a Sanyo 0.45x semi-fisheye lens that they said was in stock, took my money, and then proceeded to wait on the manufacturer like everybody else for three weeks. Don’t do business with these folks. They’re bums. I got a nice 0.42x semi-fisheye lens with an adapter ring on eBay for less than half the price and the seller shipped it to me within two days. The only problem now is that the HD2000, which has a pistol grip, looks like a flare gun or worse when I put the lens on it. I’m going to be pointing that rig at a performer on the flight line sometime this summer and some security guy is going to think I’m a nutball with a firearm and shoot me. 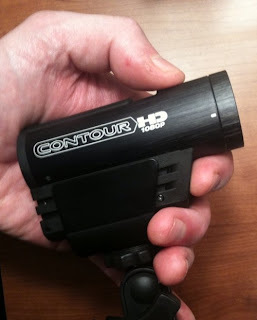 The HD2000 is probably going to be the primary camera in one of the airplanes for Acro Camp. I got it primarily because it has a microphone in jack. I can run the intercom directly into the camera and not have to deal with recording the audio separately. So the HD2000 in one airplane and the good old dependable Panasonic in the other one. I still have to check out the Pitts for camera mount points. Might be a good excuse to go out to Ray Community Airport to see it and check out camera mount points. 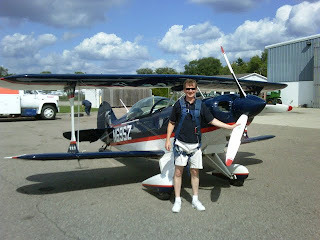 Don and I also did some pretty aggressive slipping just to show the capabilities of the airplane. From 1,000 feet AGL and a quarter mile out, we slipped it down so that we came across the numbers at flare altitude and 85 mph. Don also demonstrated some effective ways to bleed a lot or airspeed quickly, also with slipping techniques. We had plenty of airspeed above the stall in all of the slips, so I wasn’t worried that we were so cross-controlled. 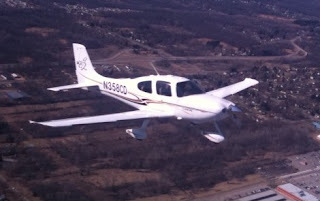 That demo gave me a lot of confidence for engine-outs and glide performance in the airplane. Often, it’s not hard to glide to the landing point in an engine-out. The challenge is arriving at the flare with enough empty space ahead of you without hitting anything on the way. With the Citabria, you can just get to where you want to be (a fairly broad window in space) and simply show the relative wind a lot of the draggy parts of the airplane. You have a pretty broad choice of altitudes at the key position from which you can get it down – from a long glide to an aggressive slip. I’m looking forward to getting up again with Don. 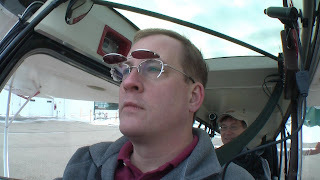 Both to confirm my thoughts about the camera mount points and angles and to expand my tailwheel and aerobatic stills (such as they are on both accounts). And to think that I once worried about running out of things to learn! Make sure that you fill out your Acro Camp cast member (“camper”) application! This is going to be a boatload of fun. Check out the announcement and casting call at http://www.acrocamp.com/ and, if you qualify, go to the Acro Camp group at http://www.mytransponder.com/ (registration required, but it’s free) and click on the link to the online application. These are the show notes to an audio episode. If you want to listen online, please use the direct link below. http://media.libsyn.com/media/airspeed/AirspeedAcroCamp01.mp3. We’ve just announced Acro Camp, the new movie being put together by Airspeed. Four people from around the country come together for four days in southeast Michigan to take over a Part 61 flight school and fly aerobatics for the first time. There’s more information at the project’s blog and website at http://www.acrocamp.com/. 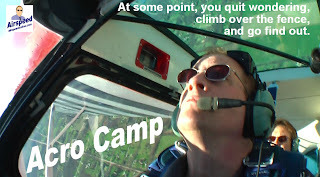 And you can join the Acro Camp group over at myTransponder (the only official Acro Camp online community meeting place). If you’re interested in being a cast member and you meet all of the criteria in the post over at http://www.acrocamp.com/, e-mail me at steve@airspeedonline.com.